For other uses, see Baretta (disambiguation). "Keep Your Eye on the Sparrow"
Performed by Sammy Davis, Jr.
Baretta is an American detective television series which ran on ABC from 1975 to 1978. The show was a revised milder version of a 1973–74 ABC series, Toma, starring Tony Musante as chameleon-like, real-life New Jersey police officer David Toma. When Musante left the series after a single season, the concept was retooled as Baretta, with Robert Blake in the title role. Detective Anthony Vincenzo "Tony" Baretta is an unorthodox plainclothes cop (badge #609) with the 53rd precinct, who lives with Fred, his Triton sulphur-crested cockatoo, in apartment 2C at the run-down King Edward Hotel in an unnamed Eastern city. Like his model David Toma, Tony Baretta wore many disguises on the job. 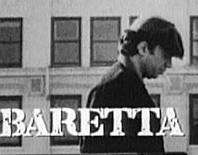 When not in disguise, Baretta usually wore a short-sleeve sweatshirt, casual slacks, a brown suede jacket and a newsboy cap. He often carried an unlit cigarette in his lips or behind his ear. His catchphrases included "You can take dat to da bank" and "And dat‘s the name of dat tune." When exasperated he would occasionally speak in asides to his late father, Louie Baretta. Baretta drove a rusted-out Mist Blue 1966 Chevrolet Impala four-door sport sedan nicknamed "The Blue Ghost" (license plate 532 BEN). He hung out at Ross’s Billiard Academy and referred to his numerous girlfriends as his "cousins". The music for the show was done by the Latin influenced rock group El Chicano from Los Angeles, California. who also released the song as a 45 and also a track on one of their albums. The "Baretta" theme song by El Chicano was a huge hit in many countries including Turkey, Malaysia, Singapore, France and The Philippines. Billy Truman (Tom Ewell), retired cop who used to work with Baretta's father Louie at the 53rd Precinct. Rooster (Michael D. Roberts), a streetwise pimp and Baretta's favorite informant. Inspector Shiller (Dana Elcar) and Lieutenant Hal Brubaker (Edward Grover), Baretta's supervisors. Detective Foley (John Ward), police detective. Fats (Chino 'Fats' Williams), a gravelly-voiced, older detective. Detective Nopke (Ron Thompson), a rookie detective. Little Moe (Angelo Rossitto), a shoeshine man and informant. Mr. Nicholas (Titos Vandis), a mob boss. Mr. Muncie (Paul Lichtman), the owner of a liquor store at 52nd and Main. The theme song, "Keep Your Eye on the Sparrow", was written by Dave Grusin and Morgan Ames; initially an instrumental, lyrics were added in later seasons that were sung by Sammy Davis, Jr. Every episode of Baretta began with the song, which contained the motto, "Don't do the crime if you can't do the time." The song was released as a single in Europe in 1976, reaching number one in the Dutch Top 40 as "Baretta's Theme". The music for the theme song was performed by Los Angeles-based Latin influenced Rock band El Chicano from Los Angeles, California. El Chicano also released the song as a 45 and also as a track on one of their albums. The "Baretta" theme song by El Chicano was a huge hit in many countries including Turkey, Malaysia, Singapore, France and The Philippines. After its initial run in syndication beginning in 1979, the series later re-appeared on TV Land in 1999 as part of a package of series licensed from Universal. Me-TV aired reruns of Baretta on Saturday afternoons in 2007. On October 29, 2002, Universal Studios Home Entertainment released the first season of Baretta on Region 1 DVD in the United States. It is unknown if the remaining three seasons will be released. ↑ "Baretta". The New York Times. Retrieved 2012-03-13. ↑ McMurran, Kristin (1980-07-07). "With Stunning Intensity, David Toma, Ex-Cop, Ex-Addict and Model for TV's 'Baretta', Harangues Kids Against Drugs". People. ↑ Armstrong, Lois (1975-04-28). "A Time Bomb Named Robert Blake Re-Explodes as 'Baretta'". People. ↑ Maçek III, J.C. (August 2, 2012). "'American Pop'... Matters: Ron Thompson, the Illustrated Man Unsung". PopMatters. Wikimedia Commons has media related to Baretta.